King Midas would have been surprised to see that, today, it's possible to create synthetic diamonds from methane. The European Domestic Agency will procure 60 synthetic diamond windows for ITER's electron cyclotron heating system. If the legendary king Midas were alive today, he might be jealous of what a company in Freiburg, Germany is achieving today. Midas could turn an item into gold, while Diamond Materials can turn methane into diamond. During the process, a microwave plasma is used to dissociate methane. With the help of atomic hydrogen, the carbon atoms arrange themselves to form a thin homogeneous diamond layer that grows at a rate of a few micrometres per hour. After a few months the result is a diamond disk, ranging in size from 40 to 100 mm and with a thickness of 1 to 2 mm. Aside from its beauty, diamond is nearly unbreakable, transparent and with a capacity to dissipate heat that is five times that of copper. The technology for growing diamond disks have been applied to various applications from dome tweeters in high-fidelity speakers, to vacuum barriers needed for ITER's electron cyclotron heating system. The electron cyclotron system will help to heat the plasma up to 150 million °C by transferring the energy from electromagnetic waves into the electrons of the plasma by injecting an unprecedented 1 to 1.5 MW of power along 56 guiding beamlines, or tubes. The electromagnetic waves, which travel in a manner similar to light, will pass through synthetic diamond windows measuring 80 mm in diameter. The windows have a double function—ensuring the efficient passage of the waves for durations of up to 3,000 seconds, and ensuring the leak tightness of the vacuum vessel. 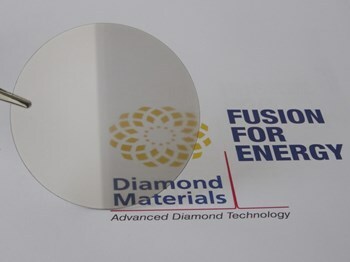 The core of the window assembly is the 1.1-millimetre-thick synthetic diamond disk, which performs the double function of a vacuum boundary and ≤1.5 MW beam transmission. The high thermal conductivity of diamond is essential to evacuate the absorbed power from the passing microwave beam, with transmitted power density up to 500MW/m2. "The diamond disk will be integrated into a mechanical structure which needs to be extra robust and mechanically stable in order to withstand the harsh Tokamak environment and ensure that the window does not fail. Vacuum-tightness is also of upmost importance since the window will confine the tritium gas used for fuelling the ITER plasma," explains Gabriella Saibene, European Domestic Agency project team manager for antennas and plasma engineering. The European Domestic Agency is responsible for procuring 60 diamond windows for ITER's electron cyclotron heating system. In collaboration with the ITER Organization and the Karlsruhe Institute of Technology (KIT), and after ten years of R&D, the European agency for ITER has entrusted the manufacturing of two prototype diamond disks to Diamond Materials, where manufacturing is proceeding well. "The next step will be to carry out optical and mechanical testing, as well as check how the disk resists fractures and how well it brazes (joins with metal), as it needs to be attached to a copper mechanical structure," according to Saibene. "Conclusion of the testing on the two disk prototypes is expected in less than one year." 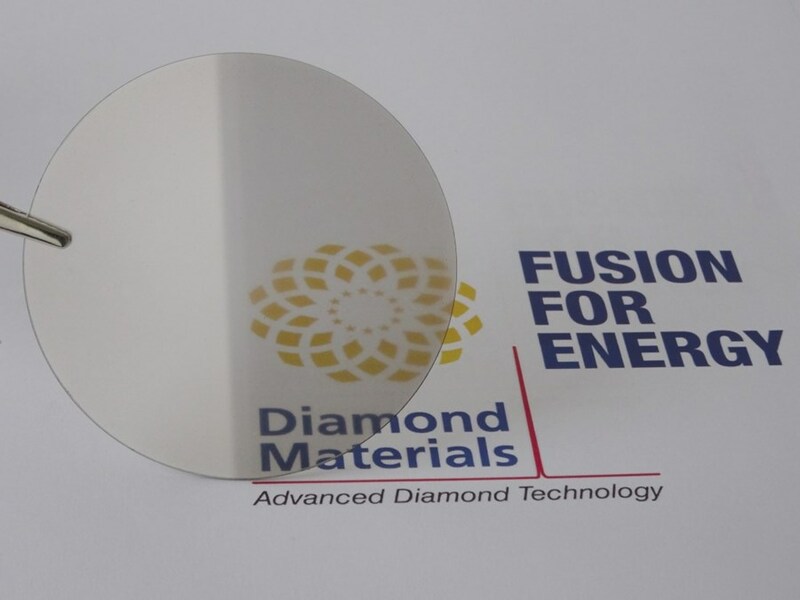 Read more about the diamond disk fabrication process on the European Domestic Agency website.